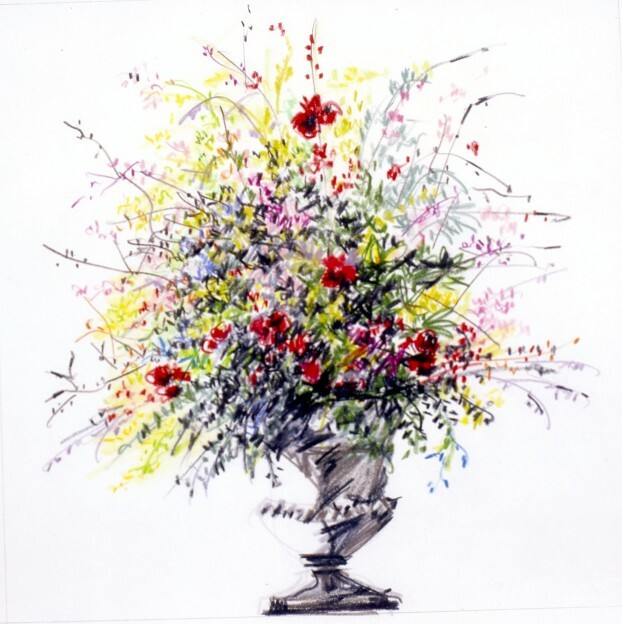 In this pencil study, Abbie Zabar captures an exuberant floral arrangement from the Metropolitan Museum of Art’s Great Hall. This week we’re celebrating the 50,000th download of the Slow Flowers Podcast. As of today, we’ve produced 97 episodes bringing you the leading voices in the American Grown floral community – from flower farmers to floral designers, the inspiring people working to save flowers as part of our nation’s agricultural heritage and keep our flowers local, seasonal, sustainable — and American grown. I am grateful to my past guests, each of whom has shared his or her story with listeners. And I’m so thankful to listeners who regularly tune in, comment, share and like this endeavor. 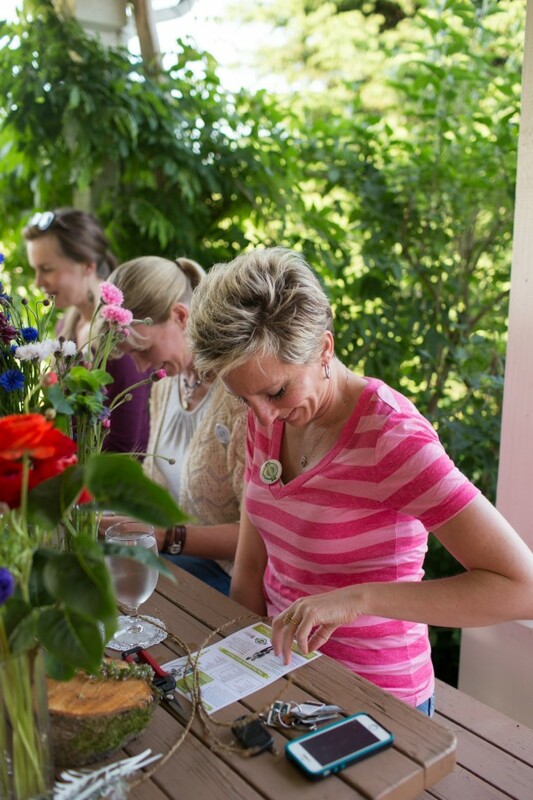 Students at Sarah Pabody’s floral design workshop learn about the origin of the flowers in their lives. (c) Elena Slesarchuk, courtesy of Triple Wren Farm. Before we meet Abbie Zabar, this week’s guest, I wanted to share a text that I received this week from my friend Sarah Pabody of Triple Wren Farms located just north of Bellingham, Washington. Sarah and her husband Steve Pabody are big promoters of the Slow Flowers Movement. When Sarah leads design workshops at Triple Wren she does something for which I’m so grateful. 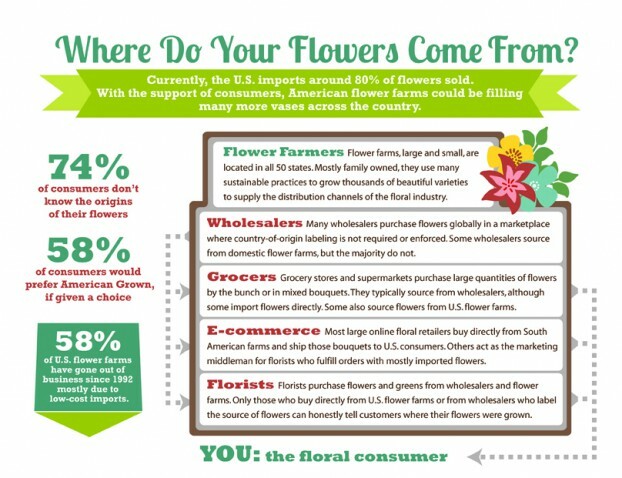 Then Sarah leads a short discussion about the frightening statistics revealing the small percentage of domestic flowers in the marketplace versus imported flowers, as well as the cost of those imported flowers, both environmentally but also economically, to local communities. She texted me photos of last weekend’s workshop, which I have permission to share with you. 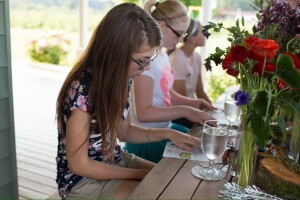 Even the youngest floral design student is introduced to the Slow Flowers Movement at Triple Wren Farms! (c) Elena Slesarchuk. If anyone listening to this story feels moved to do the same with their own customers, please follow this link to our graphics, which you are welcome to download and copy. Thanks for the inspiration, Sarah! Okay, today’s guest is thoroughly inspiring in a completely different way. 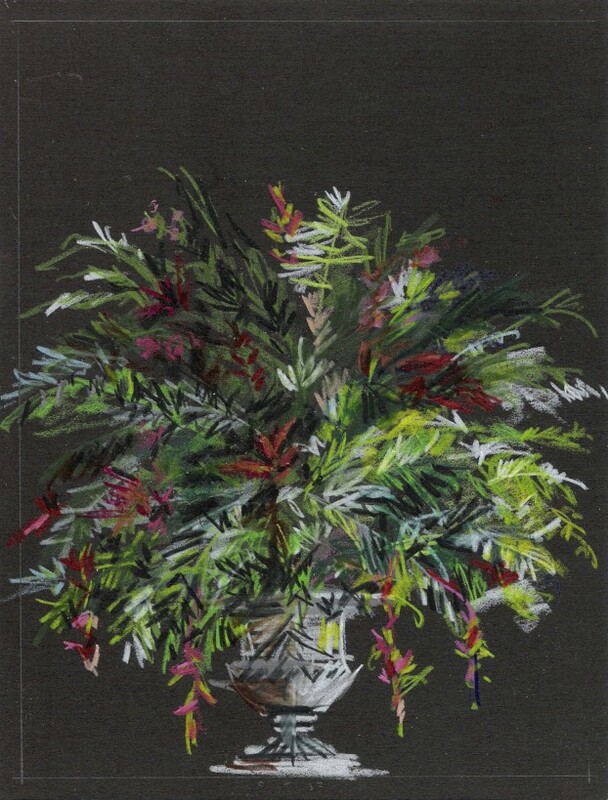 When I first read the news that the work of Abbie Zabar, a New York-based artist and longtime virtual friend in the garden-writing world, was going to be celebrated this coming weekend with the opening of an exhibit of her floral drawings, I had to share her story with you. As you will hear in our conversation, Abbie is a close observer of nature and of flowers, especially. She captures what she observes with colored pencils on sheets of rather ordinary paper or cardboard. For one decade of her life, from the early 1990s to the early 2000s, Abbie walked from her apartment in New York City’s upper east side to the famed Metropolitan Museum of Art on Fifth Avenue. She entered the impressive Great Hall during the early hours, found a place to sit, and proceeded to sketch the grand floral arrangements on display there each week. (I feel quite an affinity for someone who honored such a creative ritual week after week; after all, I managed to make a bouquet each week for one year and ritualized that practice, but Abbie’s ten-year observance is hugely impressive). Abbie was enthralled by the five enormous flower-filled urns that stood in the Met’s Great Hall. 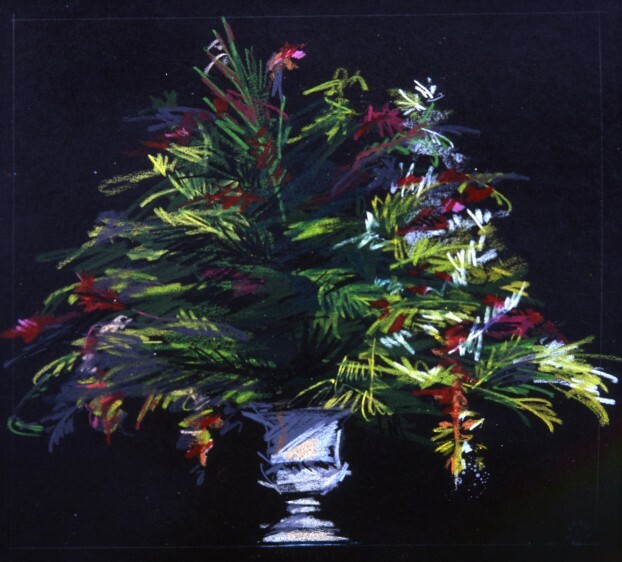 At the time, the pieces were created by Chris Giftos, the Met’s former Master Floral Designer and Director of Special Events. For more than 30 years, Mr. Giftos was responsible for the beautiful arrangement in the Great Hall. And, as Abbie describes, the flowers occupied four large niches carved from the central piers, as well as the centrally located Information Desk. 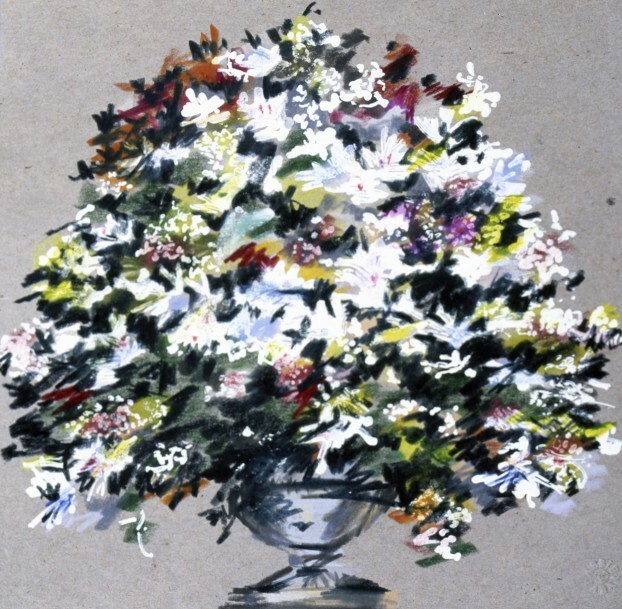 The weekly arrangements of fresh flowers appear, thanks to an endowment provided by the late Lila Acheson Wallace, who was one of the Museum’s largest single benefactors. It’s no surprise to learn that Abbie and Chris became good friends. 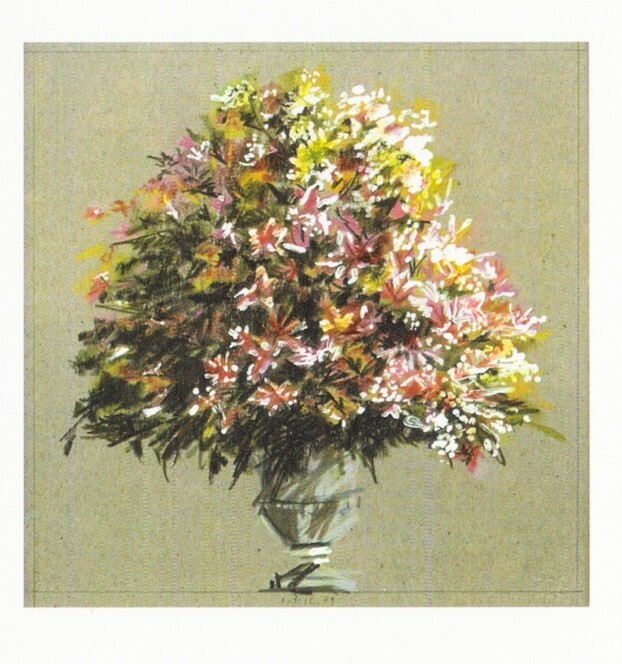 The fondness she had for this floral artist are reflected in each drawing she made in response to his work. 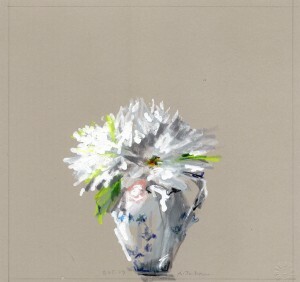 Incredibly alluring, her diminutive floral portraits are breathtaking in both their simplicity and their complexity. Abbie’s own experience as a gardener and her innate knowledge of the flowers, fronds and leaves before her allowed her to capture the splendid bouquets with a sure and deft hand, well before the Museum opened its doors for the day. Working in situ and in pencil—the only implement allowed in the space —her drawings showcase the vibrancy, variety and vitality of the displays, as captured in one quick sitting. 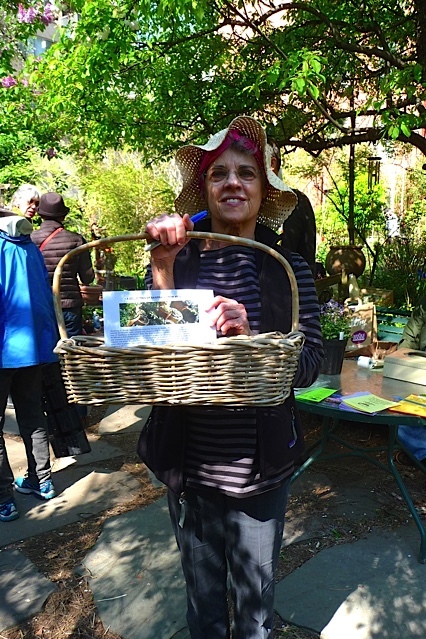 Abbie Zabar at the Manhattan Chapter of the North American Rock Garden Society’s Plant Sale, where she was passing around saxifraga “favors.” Photo courtesy of Yukie Kurashina. You will hear more about her process in our conversation, and please visit debraprinzing.com to see examples of the pieces that will be unveiled in this upcoming exhibition. 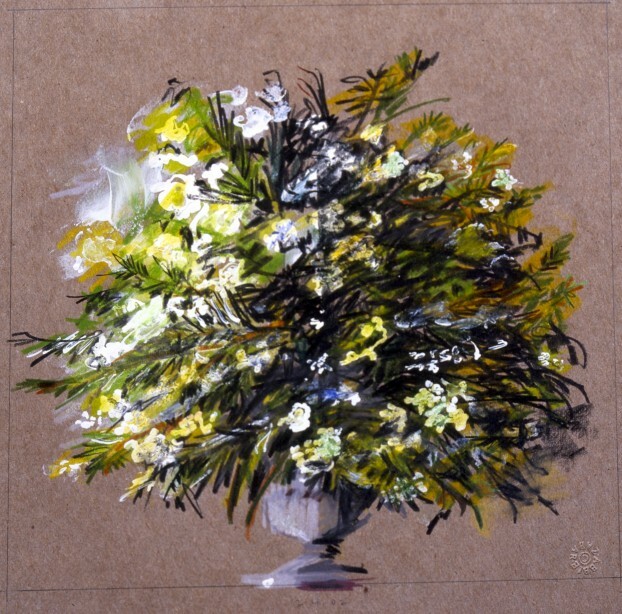 The show is called Abbie Zabar: Ten Years of Flowers, on view June 7 through October 4 at Wave Hill, a beautiful public garden and cultural center in The Bronx. The event is free with your admission to the grounds. Abbie Zabar is an acclaimed artist, graphic and garden designer, and the author of five books. Her first book, The Potted Herb (1988), is now considered a gardening classic. She has created garden and graphic designs for numerous prestigious companies and organizations, including Bergdorf Goodman, Daniel Boulud’s restaurants and PS 198. Her landscape collages have been represented by Allan Stone and BlumHelman, and Flowers in the Great Hall of the Metropolitan Museum of Art series has been represented by Ursus Books & Prints and the Horticultural Society of New York. Abbie’s artwork has been shown at the Museum of Modern Art, the Cooper-Hewitt Museum, the Parrish Museum, the International Paper Corporation, the Louvre, the Institute of Contemporary Arts (London) and the Vigeland Museum (Oslo), and is part of the permanent collections of the Mead Paper Corporation of America, the Brooklyn Museum, the Jewish Museum, the Hunt Institute for Botanical Documentation and the Smithsonian Museum. Abbie Zabar. May 17 2003. Collection of the artist. 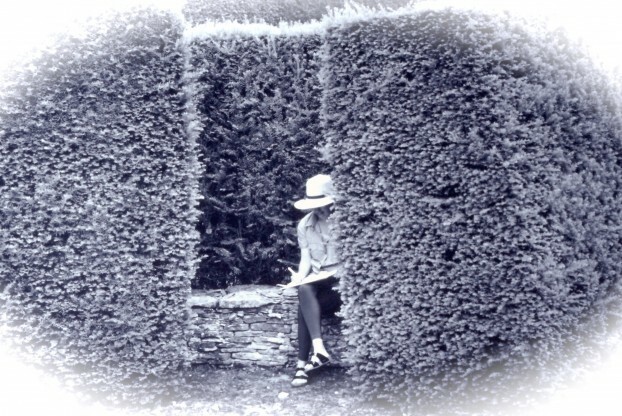 Abbie’s illustrated articles have appeared in Garden Design, Horticulture, Fine Gardening, Gourmet and The New York Times, as well as in numerous esteemed British publications. She received the 2010 Award for Best Newspaper Writing from the Garden Writers Association for her piece “A Vine in the Sky,” published in The Forward. In 2014, she was honored with the North American Rock Garden Society’s Carleton R. Worth Award, given to an author of distinguished writings about rock gardening and rock garden plants. Zabar is currently the Program Chairperson for the Manhattan Chapter of the North American Rock Garden Society and a Learning Leader at P.S. 198. 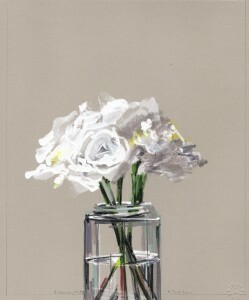 White roses in straight-sided jar. As Abbie and I discussed, not only is the exhibition at Wave Hill available for public viewing all summer long, continuing to October 4th, she has a second show in the works, which will run September 16th to October 2nd at W.M. Brady & Co., a gallery at 22 East 80th Street, just a few steps from The Metropolitan Museum of Art. 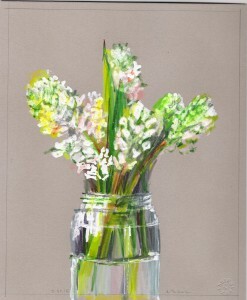 This collection of drawings includes the series of small floral studies that Abbie and I discussed at the close of our interview (and she generously shares a sneak peek of a few of those pieces here). 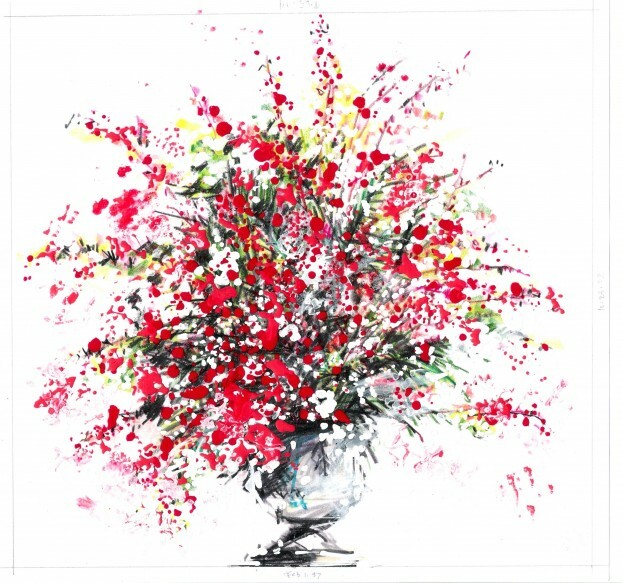 From the grand floral arrangements at the Met to these intimate moments of singular blooms captured in small vases, Abbie’s gifts as an illustrator of flowers are evident. And I know you’ll be as enchanted as I am. By the way, many of these pieces will be available for purchase, so please follow the links to the two institutions (Wave Hill and W.M. Brady & Co.) to inquire if you’re interested in a list of available works. Thank you, Abbie Zabar, for showing us flowers in a new way. Not everyone is an artist or has the ability to use a pencil so masterfully as my friend Abbie. But this conversation has moved me to use my innate skills of observation more acutely, whether I’m on a walk in the park, purchasing flowers from my favorite flower farmer, or tending to plants in my own backyard. Thanks again for joining me today for another wonderful conversation about flowers. Listeners like you have downloaded the podcast more than 50,000 times. THANK YOU to each and every one of you for downloading, listening, commenting and sharing. It means so much. This entry was posted on Wednesday, June 3rd, 2015 at 3:53 am	and is filed under American Grown, Blog Posts, Creativity, floral design, Gardening, General, Podcast Episodes, SLOW FLOWERS Podcast, Writing. You can follow any responses to this entry through the RSS 2.0 feed. You can leave a response, or trackback from your own site. LOVED THE PODCOST, AND DAVE AND I LOVE THIS ECKLETIC FLOWER GURU AND ENTHUSIAST. SHE IS SO TALENTED AND KNOWLEDGEABLE AND IT IS OUR GREATEST HONOR TO KNOW HER. CONGRATS ON HER SHOW AT THE GARDENS. 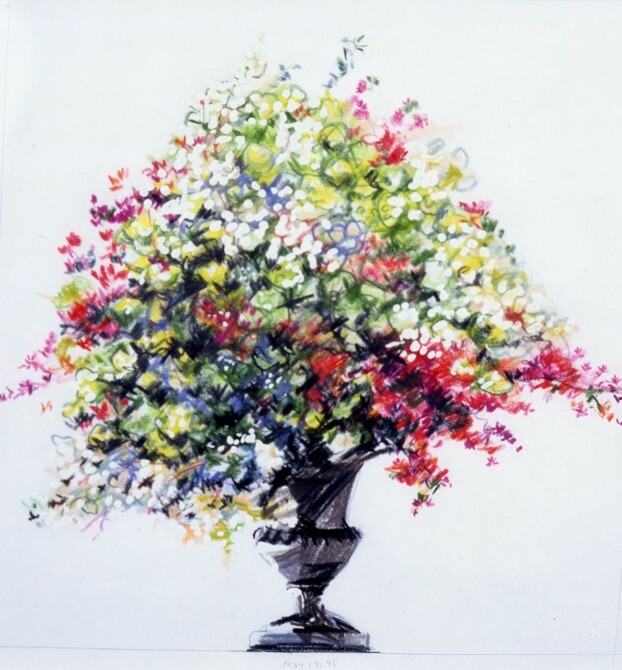 HER ARTWORK CAPTURESD “THE MOMENT IN TIME” OF EACH FLORAL BOUQUET THAT WAS SEEN AS YOU ENTERED THE DOOR AT MOMA FOR THAT DECADE TIME PERIOD. THE lighting on these floral arrangements was just perfect. Bravo Abbie Z.